In the years since 9/11, Max Boot has demanded military intervention in Afghanistan, Iraq, Syria, Libya, Iran and North Korea and likely many other places. He has called for the U.S. to topple the Saudi monarchy. And of course, like so many neo-cons, Boot fell headlong into the Russia conspiracy nuttiness for more than two excruciating years. According to Max Boot, the idea of toppling the Libyan government, which was deranged, was, in fact, brilliant. We just didn't do it right. "We did a great job of overthrowing Gaddafi, but they had nothing to secure the country afterward," he said. "And there was, I might add, a similar lack of planning for our pullout in the case of Iraq, where there was very little sense of what would happen after U.S. troops left in 2010. We can't think about these as being kind of quick in and out engagements. We send some troops, kill some people and then come back home to a victory parade. Sadly, it doesn't work that way." Boot didn't explain how exactly it does work; he didn't need to explain. Everyone knows his assumption. It's the same as permanent Washington's core assumption. Military occupation is always the right answer, no matter what the question is. Sending somebody else's kids to a foreign country is always, in everywhere, the right thing to do. When Donald Trump pledged to pull Americans out of Syria, Max Boot went crazy, just on principle. 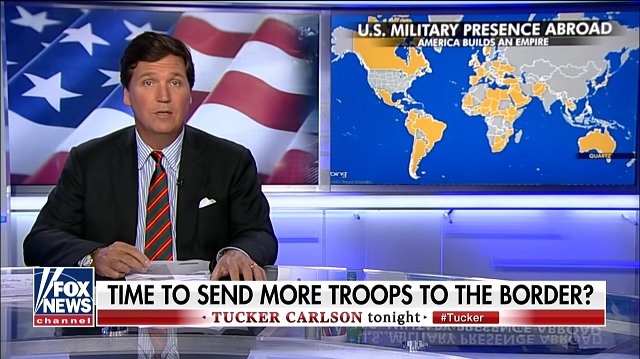 Because no troops can ever leave -- ever. "There is nobody who knows anything about the situation in Syria who recommends doing this," he said. "This is a Christmas gift to America's enemies. This will help ISIS. This will help Russia. This will help Iran. This will help Bashar Assad and this will hurt Israel and our Kurdish allies." What did Max Boot not say? What do you notice about that? Well, he never explained how keeping Americans in Syria would help the United States. Why didn't he mention it? Because he doesn't care. Nobody in Washington cares, and maybe that's why you never hear anyone ask questions about our current military commitments. Are we overextended perhaps? We have the numbers. As of Tuesday night, we have nearly 175,000 active duty personnel serving overseas, American troops are posted in 158 different countries. For perspective, there are only 195 countries total on the entire planet. We're almost everywhere. Keep in mind there is no world war currently in progress. This is what we've signed up for in peacetime. And yet, you may notice that there was one place American troops are not. They are not on our southern border protecting us. They should be, we could use them. Tens of millions of illegal immigrants already live here in the United States. We don't know the exact number. We don't even know who they are. They just show up and a hundred thousand more are showing up every month. Over time, this is how countries collapse. Max Boot doesn't think that's a crisis. Nobody in Washington thinks it's a crisis. As far as they're concerned, illegal immigration is just some right-wing talking point that Trump throws to his base at rallies in Grand Rapids. You know what they think is a crisis? You know what they're really concerned about? Medical care in Morocco. That's a problem we must solve immediately. Luckily, we have Exercise African Lion. Never heard of it? You're paying for it. In the last year, 1,100 US military personnel have participated in that exercise, all of them working to make Morocco healthier. Or how about the plight of the Ethiopian Navy? The Ethiopian Navy needs a lot of help, considering that Ethiopia is entirely landlocked as a country. Thank heaven for our Sixth Fleet, they're on it. The Navy just sent out a press release last week bragging about new talks with the Ethiopian government to "discuss the exciting task of building the Ethiopian Navy." Feel safer? The people of Mozambique feel safer. U.S. military aircraft have flown 60 missions. They've transported more than 663,000 metric tons of relief supplies in there in the wake of a cyclone. That was nice. And we could go on and on. Now, these are all good works, virtuous things, done at taxpayer expense, by the most altruistic country in the history of the world. That's us, the United States. But what about us? What about our country? We're being invaded. No offense to the Ethiopian Navy, but we could use American troops a lot closer to Tijuana than the Horn of Africa. Max Boot and his friends scoff at this. Troops on our own border? Protecting our own people? That's disgusting. Immoral. It's fascism. Only in Washington do people believe that. 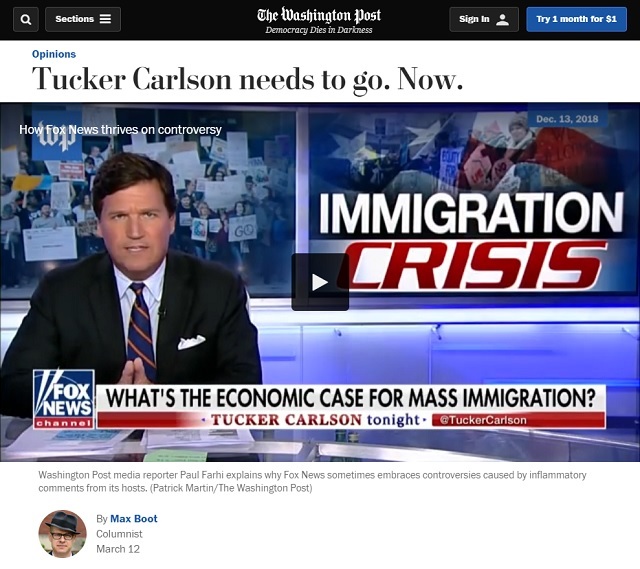 He can't stand the fact Tucker consistently calls out his and his neocon buddies' hypocrisy.